"We didn’t play like we wanted it. It falls on the leadership of this team. It falls on the starters, the playmakers." "It’s not surreal, it’s reality," Bush said. "We had everything right there in front of us to keep control of the division and we didn’t make it happen." "We have two games to play and we’re one down in our division," Schwartz said. "That’s the only thing we need to worry about, that’s the only thing we need to concern ourselves with right now. "We need to find a way to come back with a win against the Giants, go on the road, beat the Vikings and let the dust settle and see where that takes us." The Lions came in calling this a "must-win" game because they knew that control of their destiny was on the line with the Bears and Packers both winning their last two games to get back in contention. 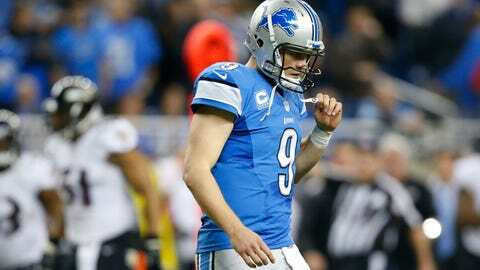 "I didn’t play my best game by any means," Stafford said. "We had some things going there," Johnson said. "Some critical third downs, we could have kept drives going. "When that happens, you just didn’t look the ball all the way in. It’s as simple as that. I’ve just got to stay on it one more second. It’s fundamental." "I just think we didn’t execute," he said. "We had at least two third-and-ones that we should have had, that we can make in our sleep." Schwartz added: "I don’t know Calvin Johnson or Stafford to be jittery. It falls into they’re human beings. As much as we say Megatron and things like that, there’s still a human element to the game. You’re not going to catch every single one. Every single pass isn’t going to be perfect." "I like the character of our team," he said. "I like the toughness of our team. I like our quarterback. Our quarterback will bounce back. He’s going to play great over these next two games." Asked whether there was enough sense of urgency by the Lions, Bush answered bluntly: "No, there wasn’t. It was pretty evident."